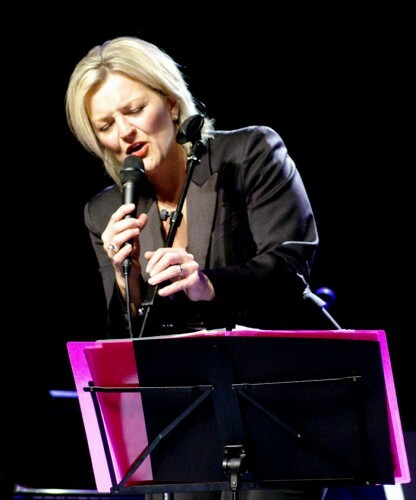 DPA Microphones’ new d:facto II Vocal Microphone has made internationally acclaimed jazz singer Claire Martin OBE very happy indeed. Since switching to the new microphone, Claire says she has never heard so much clarity in her voice and the difference is so noticeable that all the sound engineers she works with are making positive comments. "This is definitely the right microphone for me," she says. "It picks up all the colours in my voice and I can hear every breath, which makes it easier to control phrasing. It almost makes singing easier as I can try out vocal idea's and actually hear myself changing the timbre of my sound – something I felt was lost with other microphones. It also delivers without me having to be right in too close to the mic, so I can definitely play around with lower end notes by coming in a little closer for a bassier response. This works really well in ballads, I feel." Claire, who has been singing professionally for over 25 years has garnered numerous awards and rave reviews for her work, including winning the BBC Jazz Award for Best Vocalists and six British Jazz Awards. She has released a total of sixteen albums, all on the Linn label, and has collaborated with various prominent musicians including Martin Taylor, John Martyn, Stephane Grappelli, Kenny Barron, Sir Richard Rodney Bennett, Jim Mullen and Nigel Hitchcock. In addition to her singing career, she is also a co-presenter for Jazz Line Up on BBC Radio 3 which is now in it’s thirteenth year. Claire’s decision to try DPA’s d:facto Vocal Microphone was inspired by a sound engineer who was working with her at the Pizza Express Jazz club in London’s Soho. "The engineer was raving about the mic and saying how it would suit my voice," she explains. "Other singers and also my record company Linn Records, had often talked about the quality of these microphones - so at last I was able to try one out in an intimate club setting. I was immediately impressed by its lightness and handling." The d:facto Vocal Microphone was supplied by DPA’s UK distributor Sound Network and after that initial try-out, Claire was hooked. "The d:facto captures every nuance of my vocal sound and, once I had worked out the direction handling, it actually made me feel very confident about my diction and tone. I also notice that I don’t lose any level when I give my sound more power and pull away from the mic. The sound is still clear and full and more rounded. You can hear the whole breath and, as a jazz singer, this is the sound I'm after. This microphone certainly delivers what I want and I definitely feel I'm using the best microphone there is." Claire’s d:facto Vocal Microphone is now in use at every one of her concerts – and thanks to its ability to deliver high quality audio she feels she can cope much better with whatever the PA system throws at her. "In jazz clubs, some PAs are better than others and this microphone gives me a fighting chance of getting a great sound," she says. "I also love how light it is." In June 2011, Claire was appointed Office of the order of the British Empire (OBE) for services to music. She is currently touring with Brighton based cellists the Montpellier Cello Quartet, showcasing new arrangements for voice and cello quartet by Sir Richard Rodney Bennett, Mark Anthony Turnage and Djano Bates. She plans to return to the recording studio later this year to begin work on her 17th album.